The Seca 755 dial column medical scale can do something that other mechanical scales cant determine: the BMI (body mass index). The BMI is recognized by the World Health Organization as being the indicator of ones individual nutritional condition. Includes the Seca 222 measuring rod to become a all-in-one mechanical weighing and measuring station. The elegant all-round solution is especially suitable for use in the general medical sector in doctors offices and hospitals. 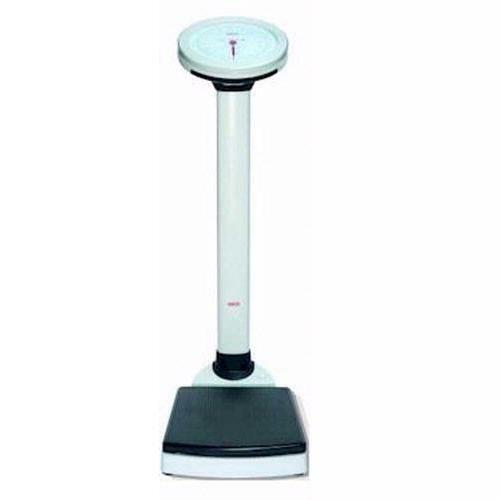 When installed in pharmacies and gyms, this scale provides an exclusive additional service for customers. This classic telescopic height rod is a classic favorite and a best seller world wide. The Seca 220 headpiece is secured on both sides for accuracy and folds down for a greater degree of safety. When added to Seca scales, it becomes a precision weighing and measuring package.